Animation is a technique of capturing different drawings and putting them in separate frames over time to create illusions so that it makes the object look like its moving. There are many different types of animation that creates different types of movement for a unique style such as 2D animation makes the animation look really smooth depending on the frame rate, Pixilation animation is a lot more jittery then 2D animation because you just take out some random frames to give it really creepy movement. Stop Motion: This is animation is captured in one frame at a time, they also have physical object moving between different frames. When yo play through the frames it creates an illusion that the physical objects are moving in a sequence.The main industries that use this type of animation are Film industry, Game industry and the website industry. The founder of stop motion was J. Stuart Blackton in 1897. 2D Animation: 2D animation is done only using the X and Y axis to animate objects to move without depth and rotation.This also can create a really smooth movement depending on how many frames you do just for one movement and also you have to draw out every frame to make the movement look more realistic and not just a bunch of random movements. The first person to make 2D Animation is Emile Cohl in 1908. Clay animation: This form of animation is done by people making the character models or assets that are in the animation in clay and changing the position of the models to make it look like they are moving and have a physical features of a human or whatever object they want. This was first made in the 1900’s, the first and most famous animation was Wallace and Gromit made by Aardman Animations. 3D animation: 3D animation is animation using only Z axis which enables you to animate in depth and rotation. 3D is a really good way to make games, films and short films look realistic and awesome, because of all of the affects that you can do to make a character move smoothly and anything you want. It also is really good for entertainment because whatever you use it for you can do so much since you can use the Z axis which gives you a wider range to animate. The first person to make 3D animation is Ed Catmul in 1972. Thaumatrope: This is a device in the 19th century that has a disk with drawings on each side. This creates an illusion that it is moving if you rapidly spin one side to the other. The discs are also attached to a string that will make it a lot easier to rotate rapidly enough to make it look like it is moving. The person who invented the Thaumatrope was John Ayrton Paris in 1825. Zoetrope: This is a cylinder with holes around the outside so that people can look through, then people draw what they wanted to be animated but they will have to do it in stages like frames but on paper, then all you have to do is spin the cylinder around and look through the hole and you will be able to see animation, this will probably not be as smooth as 2D or 3D because you cant fit as many frames and edit as well. Because it is cylinder you will not be able to do a full scene because there is a limit of how many frames you can do. The person who invented the Zoetrope was William George Horner in 1834. The Magic Lantern: This consists of oil painting, a simple lens and a candle or a oil lamp. In a dark room the image will appear projected onto a adjacent flat surface. It was mainly used to project demonic, frightening images that convinced people that they were witnessing the supernatural. Some slides for the lanterns contained moving images which would scare people even more because in the time of 1650 it was really rare for animation to exist so if they saw a moving image they would easily believe that it is real. 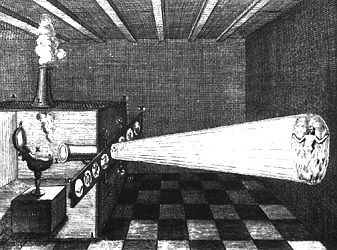 The person who invented the Magic Lantern was Christiaan Huygens in 1650. There are many different uses of animation e.g you can use animation for tv shows like cartoons and anime. Animation can also be used for games to make them more realistic and interesting for example in the background of games like Mario and Sonic. Another use for animation is advertisement, adverts like Bupa and direct line use animation because it catches the audiences attention instead of a boring still images people will remember a certain advert if it had its unique animation and style to it. Education is also a use of animation because it will help people remember different facts and statistics about a certain subject. Also if someone just used still images students will be bored of it and wont pay attention where as if it was animated it will draw their attention and they will learn it without even realising it. This is also mostly done in like power point presentations or films, another example is halifax, they use top cat to interest kids and make them listen because of how important the message is that they are trying to give, and also it makes it interesting and fun for them. Also Halifax gain interest from adults as well. Animation is also used in creative arts are to show and produce the skills needed to achieve for their grade for example in an IT class they will use animation in a presentation so they can show the students the type of skills that they will need and what it will need to look like in there project. Animations are also made in online sites like YouTube, Twitter etc. its mainly used for entertainment purposes but they also use it so they can teach and make it easier to navigate through the website. They also use it in game trailers to make the game more unique, also sometimes games like clash of clans make a 3D animation when the actual game is 2d top down but they do mention that it is not real game play footage. Some trailers use 360 view so that people can look and turn there phones to 360 degrees and have different camera angles. Cinema 4D: Cinema 4D is a 3D modelling software that allows people to get primitive shapes and extrude and create what they want but that’s not the only feature, it also allows you to animate your 3D objects into moving any way you want it to, it also lets you move your camera freely to record things like a cinematic for your animation scene. You can also add in texts and make them move in a way that fits your camera movement which is called motion tracking. An example of a show that was made by cinema 4d are models made in games and 3d animations. After Affects: This is also a good way to do 2D animation, this allows you to make awesome special effects for your animation scene. This software doesn’t allow you to add sound on it because it is purely based on animation. Its not just based on special affects you can also create character and use tools like the puppet tool to make realistic movements, but the only problem with it is that you can mess up the points where you want to move them so it stretches instead of having smooth animation. You can also change the frame rate up and down which is really helpful to make different affects. After affects was used to make a film called Iron man 3. Maya: This is also a 3D modelling and animation software that allows you to model character and assets in your seen. This is a really good program because the camera movement is a lot better then cinema 4D and it is also really good for animation too, you can make your scenes look realistic and if you render something it is still the same as cinema 4D because you need a low poly count to render faster depending on how good your PC is. Cel Animation: This is a transparent sheet on which objects are drawn or painted for the original hand drawn animation. The person who invented this was Earl Hurd in 1914. An example of cel animation is Snow White and the seven dwarfs directed by William Cottrell in 1937. • Ammend Microscope to Mutoscope. Include details of inventors/pioneers and the dates associated. • Expand upon Cel Animation – ensure this features details of the technical process, as well as pioneers in 2D Animation (early cartoons). • Research into other animation software used within the industry today (give examples of shows and productions that use them). • Provide visual references and examples to your ‘sectors that use animation’ section.